During the first two project periods, the hydroformylation of long-chained oleo-compounds was established successfully with thermomorphic solvent systems (TMS) at TU Dortmund and micellar solvent systems (MLS) at TU Berlin. The application of advanced process control methods has been essential to realize a reliable operation of such complex processes. Different model-based control and optimization schemes were developed and successfully implemented in the mini-plants. The application of these methods constituted an invaluable support during the validation of the process concepts. This was particularly relevant in the case of the MLS-Miniplant, where due to its high complexity a stable operation was only achieved after the application of advanced control concepts (dynamic real-time optimization). A significant finding of the second funding period was that the behaviour of the real processes can significantly differ from the model predictions, which is the reason why the consideration of model uncertainties is absolutely necessary. Furthermore, due to the long settling time of the processes, traditional schemes based on steady-state models must be extended to include dynamic information. Thus, together with fully automatized mini-plant systems at both locations, the applied methods and strategies are to be significantly extended and applied online to ensure the successful fast track development of a new process and its stable operation - the reductive amination and hydroaminomethylation of long-chained aldehydes in thermomorphic solvent systems and micellar solvent systems. The goal of this subproject is to develop strategies for the stabilization and economic online optimization of the operation of the mini-plants situated in Berlin and Dortmund as well as a strategy for the time optimized plant start-up for the mini plant in Berlin. The main challenge is the inexact description of the behavior of the plants by the available process models, which however are formulated as rigorous models (similar to industrial case). This especially holds for a new complex and scarcely investigated processes - the reductive amination and hydroaminomethylation of long-chained aldehydes in thermomorphic solvent systems and micellar solvent systems. Thus, high model uncertainties are to be expected. Moreover the operation of such complex systems poses challenges regarding the measurability of needed process variables, perturbated plant operation, and complex physico-chemical phenomena which need to be tackled using appropriate cutting edge methods. These methods are to be applied online on complex closed loop mini-plant systems, incorporating uncertainty with different approaches. 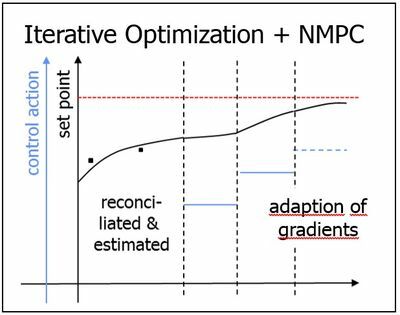 In the case of the TU-Dortmund miniplant, the iterative set-point optimization method (Modifier Adaptation) developed during the second funding period will be integrated with a state-of-the-art model-based control scheme (Model Predictive Control, NMPC) to achieve optimal process performance and a fast disturbance rejection. 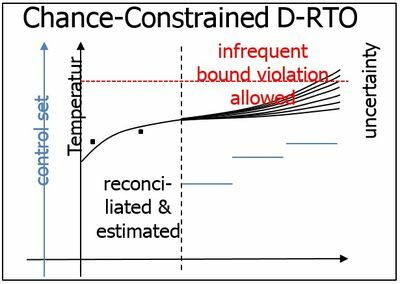 In the case of TU-Berlin miniplant, Dynamic Real-time Optimization (D-RTO) will be extended to consider model uncertainties by formulating an optimization problem using chance-chonstraints, to ensures that the probability of satisfying constraints is above a predefined level. Fig. 2: Iterative optimization handling the plant-model mismatch via modifier adaption of objective function and gradients. Nonlinear model predictive control is used to cover necessary transition states and speed up the optimization. Fig. 3: Chance constrained optimization incorporating model uncertainty as an uncertain parameter space. Optimal trajectories are calculated, under constraints representing the probability of bound violations regarding the uncertain parameters. For both approaches, the most important prerequisite is the development of dynamic models for the selected process units and operating conditions, whereby experimental data and simulation results of the project areas A, B and D are used. At the beginning of this funding period, D4 carries out the dynamic modelling of the processes is and the development of process control concepts for later use. The first flowsheets (process design) developed in D1 are evaluated in terms of controllability, operability and instrumentation and the results are validated in the mini-plants. Furthermore, the observability of model variables from plant measurements and especially errors in plant those must be also considered in an optimal control scheme. 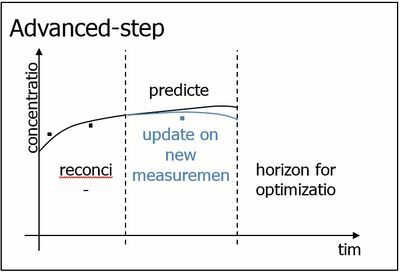 Therefore, the optimal scheme is extended with (see figure): (1) a robust data reconciliation (DR) module, (2) a state estimation (multi-rate Kalman filter or moving horizon estimation, MHE) module. 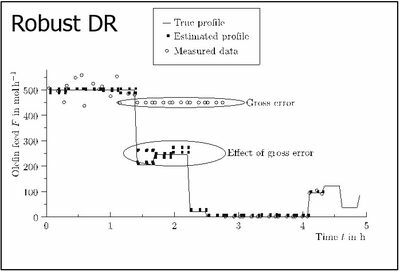 The DR module provides a consistent set of metrics based on current and past data, taking into account the occurrence of outlier (gross errors). 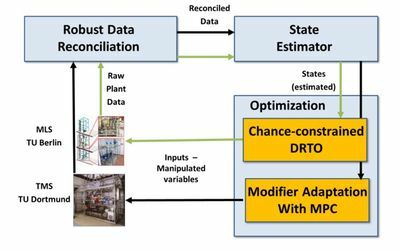 Based on the DR, the state estimator calculates a valid plant model state according to the current plant state (measurements), which is the starting point for the subsequent optimization.